CENTER TYPE selects 1 of 4 types of center cross hairs. 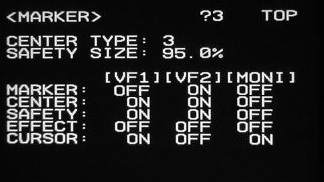 Every frame line can be displayed in each of 3 separate outputs: VF1 and VF2 (the two viewfinder multipin plugs on camera front) and MONI (the HDSDI BNC plug on side of camera). Usually VF1 is used for the viewfinder, and MONI goes to the on-board monitor, and then onwards to other on-set monitors. Note that the when MARKER is ON in this page, all the frame lines can then be toggled ON or OFF by means of a switch on the SONY Viewfinder. 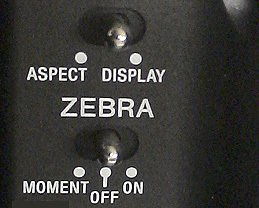 To toggle: repeatedly click top switch leftwards toward ASPECT.